Omega's Speedmaster Professional Apollo 11 45th Anniversary wristwatch commemorates the first lunar landing and celebrates its link to the chronograph that was part of the mission. Forty-five years ago this July, astronaut Buzz Aldrin stepped out onto the lunar surface and — in addition to becoming the second man to walk on the moon — became the first to wear a watch on another world. Now, four-and-a-half-decades later, the Swiss watchmaker behind the moonwalker's timepiece is honoring the historic occasion with a new version of the chronograph. 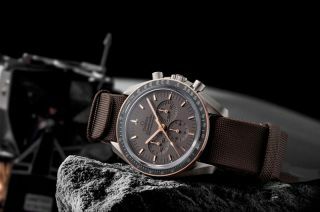 The black and gold watch, which will be available in stores beginning in June, was announced the day before the start of Baselworld, the annual watch and jewelry trade fair held in Basel, Switzerland, where Omega will display the Apollo 11 45th Anniversary Speedmaster, among other watches. The anniversary edition, limited to 1,969 pieces, includes some of the same features as the chronograph Aldrin wore in 1969, including its three dial display and manual winding movement. The 45th anniversary watch also features a brown, coated-nylon fabric strap which Omega says was inspired by the NATO straps that have equipped the timepieces issued to military personnel since the end of the 1950s. The Speedmaster that Aldrin wore over his spacesuit was held in place by a black Velcro strap. All of the Apollo astronauts were issued Speedmasters to wear while on the lunar surface, and all but one of the 12 men wore them on their moonwalks. Neil Armstrong, who preceded Aldrin out of Apollo 11's lunar module Eagle, left his Speedmaster in the lander to replace a timer that had malfunctioned. Omega has not yet revealed the case back design for the Apollo 11 45th Anniversary Limited Edition, although if it is like many of the Speedmasters released since the Apollo missions, it will include the inscription, "the first and only watch worn on the moon" (a claim that is mostly true, less a single, unauthorized Bulova chronograph). The Apollo 11 45th anniversary watch is the latest in a line of Speedmasters that have been issued to commemorate historic flights. Earlier Omega timepieces have celebrated 30, 35 and 40 years since the first lunar landing, the 35th anniversary of the Apollo-Soyuz Test Project (ASTP), the 40th anniversary of the first American spacewalk, and 50 years since the first Omega Speedmaster flew in space. Astronauts and cosmonauts today continue to use Omega Speedmaster watches in space while working aboard the International Space Station. The Omega chronograph was selected by NASA as "flight qualified for all manned space missions" in March 1965 after trials subjected timepieces from multiple companies to the environments encountered during spaceflights to Earth orbit and the moon. Click through to collectSPACE to see more photos and video of Omega’s Speedmaster Apollo 11 45th Anniversary Limited Edition wristwatch.